soL: What is the context and what are the main drivers behind the current wave of protests in Iran? Can you also comment on the impact of neoliberal economic policies on the current crises? Mohammad Omidvar: As per our Central Committee's statements over recent days, the Iranian people's protest against the regime has its roots in the deep socio-economic crisis in Iran. The neoliberal policies of the Iranian regime over the past two decades - fully supported and indeed praised by the World Bank and IMF - have pushed millions of Iranians below the poverty line and into a life of hardship un-paralleled in our recent history. Rampant inflation, especially the rise in the price of basic commodities beyond ordinary peoples' means, combined with massive unemployment, especially amongst the youth - which, according to officials in some provinces, is as high as 50% - as well as the continued suppression of peoples' democratic rights and freedom, have pushed our country to the point of this social explosion in anger against the rule of political Islam. It is also worth mentioning that, prior to these massive protests, we had increasing workers' protests in various industries and in different cities across the country against unpaid wages (some of whom had gone over a year without their due pay), widespread privatisation, lack of job security, poor treatment by employers, lack of workers' rights and a total ban on independent class-oriented trade unions. soL: Based on the reports, there are different protests with different demands, carried out by different groups, under different slogans. Why do these demonstrations vary from city to city or even between different protests in the same city? While some protests are reacting against the Rouhani government, some others are more vocal about 'regime change'. In your opinion, what is the necessary path to be followed? MO: The escalation in peoples' discontent and anger towards the regimes’ leaders for the deteriorating socio-economic situation and - more importantly - the readiness and willingness of the frustrated masses to take on the suppressive apparatus of the regime, is an important indication of the significant developments in the preparedness of the people in opposing - and waging an open struggle against - the rule of the Islamic Republic of Iran. It is understandable that under a brutal dictatorship, organisation and coordination of the huge number of demonstrations - sometimes in more than 50 towns and cities across the vast country - has its own constraints. But the slogans, in the main, voice important economic and political demands by the people, target corruption in all branches of power and declare that all key factions in the thus far prevailing power structure are fully responsible for the deep socio-political crisis in the country. 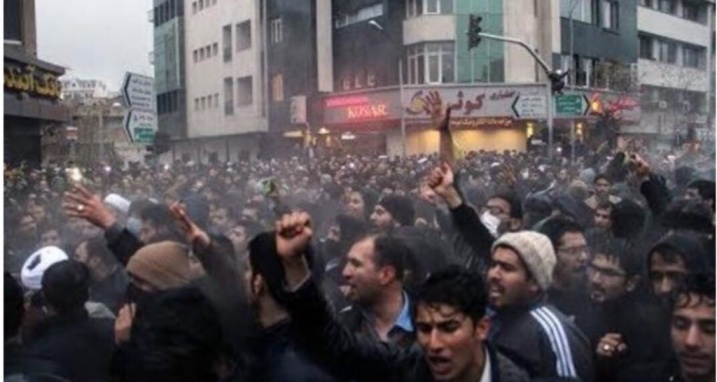 Contrary to the claims of some leaders of the pro-regime reformists that such protests are "conspiracies" against the Rouhani presidency by the hardliners, we deeply believe that the majority of the people of our country are disappointed and frustrated with the slogans of those whose only objectives are to make some cosmetic and minor adjustments to the current regime. Our people are now demanding fundamental changes in the governance of the country. Today, only those who would like to somehow preserve the current disastrous situation fear the escalation and growth of the people's struggle. The experience of the last two decades and several presidential, parliamentary, provincial and local elections that have been held and manipulated under the control and direction of the Supreme Leader, has proved that the people are rapidly moving away from the strategy of making a choice between "bad and worse" and are no longer willing to submit to the manipulation of their demands by the regime and the pro-regime reformists whose roles, these days, are to serve the strategic interests of the regime. It is also worth mentioning that, from our point of view, the current power structure in Iran centres around the "Supreme Religious Leader" (Vali Faghieh), his close allies in the religious hierarchy, the leadership of the Iranian Revolutionary Guards Corps (Sepah Pasdaran) and other security forces. The class base of the Iranian ruling clique is the big merchant and bureaucratic bourgeoisie. This corrupt and anti-peoples' power structure has moved towards controlling not only all of the political apparatus but also most of the economic levers - plundering the country's wealth on a scale not seen in Iran over the past four decades. Attempts over the past two decades to introduce some superficial reforms and the fashioning of a more moderate face for what, at the end of the day, remains a medieval dictatorship, have failed and therefore it is not surprising that the overwhelming majority of the people in Iran today want to put an end to the despotic theocratic regime; to end the oppression and injustice; and bring about the establishment of human and democratic freedoms and social justice. We believe that these demands can only be achieved through a joint struggle of all the national, democratic and freedom-loving forces in Iran without any foreign intervention. soL: Of course, Israel-USA-Saudi Arabia trio sees the protest as an opportunity to get rid of the obstacle against their policies in the Middle East, but do protests have a potential to be manipulated and meet the expectations of this alliance or Iranians already put a distance with their demands with the expectations of imperialism? Do you think, Iranian protests are immune to imperialist manipulations which had driven the rightful protest in the early days of Syria into a full-scale proxy war against Syrian people? MO: The Central Committee of the Tudeh Party of Iran, in its first reaction to the people's protest against the regime, clearly indicated that under the critical conditions of the current dangerous regional tensions and Imperialism's desire to control the Persian Gulf and its oil flow, the regional reactionary forces - supported by the Trump administration and the right-wing government of Netanyahu in Israel and the Saudi criminal regime - are seeking to distinctly impact the developments in our country and to replace the current reactionary regime with another reactionary regime. The support of these forces - i.e. US imperialism, the regional reaction, and the right-wing government of Netanyahu - for the Iranian monarchists and those political groups whose agenda is to cooperate with the most reactionary regimes of the region and to persuade the European states to impose sanctions on Iran’s economy – (thereby exacerbating the misery for the destitute and disadvantaged people of our country) and to encourage foreign states to intervene militarily in Iran, leaves no room whatsoever for any optimism regarding the future designs of such "opposition". We have emphasised that the progressive and democratic forces of Iran must increase their presence in the protest movement of the masses - more than ever before - providing proper people-oriented slogans, offering sensible guidance and relying on the legitimate demands of the masses for abolishing the existing suppressive regime and ending the economic deprivation, oppression, injustice and plundering of the natural and human resources of the nation, while sidelining and opposing reactionary and divisive slogans. We believe we must learn from our past experiences and what happened following the 1979 revolution and not allow the heroic struggle of our people for freedom, democracy and social justice to be hijacked by a bunch of reactionary opportunists who do not believe in the people’s rights or democratic freedoms. soL: During his election campaign, Rouhani presented the nuclear deal as a success story and expected to overcome the problems with imperialist countries as long as Iran integratedto the global capitalist system. While international sanctions were eased, the US didn't put an end to its unilateral sanctions against Iran. Do you think the nuclear deal was a success story for Iran or not? As of today, Iran’s nuclear programme is no longer, under any fictitious pretext, a threat to global and regional peace. Rather, Iran’s nuclear programme will serve modern technology in line with the development of the country, and the stability and security of the region…" There is no doubt that the implementation of the agreement was a significant event that had a substantial impact on political developments in our country. There were certain improvements in diplomatic relations between the Iranian regime and the US administration. However, despite all the propaganda claims of the leaders of the Islamic Republic of Iran (IRI) and the assessments of a number of opponents as well as supporters of the theocratic regime, the government of Hassan Rouhani effectively agreed to all conditions limiting Iran’s nuclear industry in return for the lifting of the sanctions and the release of Iran’s assets by the West. At the time, our Party welcomed the move away from tension and conflict and the lifting of the horrendously damaging economic sanctions, which were badly hurting ordinary people and the economy in Iran. Two years on it must be said that people have seen very little benefits in terms of an improvement in their economic situation as most of the financial benefits have gone straight to the regime’s leaders and their cronies. Under the continuing pressure of the US international banking system, the banking and monetary sanctions were never lifted and, this in effect, maintained the difficulties for Iran’s international trade with the rest of the world and the lot of the vast majority of ordinary Iranians. soL: What is your Party’s view on external interference in Iran and its danger to the people’s movement? Can you elaborate with reference to the positions taken by Trump, the Israeli government, Saudi Arabia and the forces they support? MO: After Donald Trump’s visit to Saudi Arabia - and subsequently to Israel - in late May 2017, the Persian Gulf and the Middle East are once again witnessing an escalation in tensions that could further destabilise the safety and security of the region and, in our view, have dangerous and destructive consequences for our country. During this visit, Trump clearly indicated his support for the dangerous adventurist policies of the Saudi Arabian leadership and offered Israel a carte blanche in pursuit of its dangerous policies towards the Palestinian people and the region as a whole, singling out Iran as a target. The threatening and belligerent statement of the reactionary Defence Minister of Saudi Arabia that "we will work so that we take the battle inside Iran" was promptly followed by the first bloody terrorist attack to be carried out by Daesh (IS) in Tehran. Rex Tillerson, the United States Secretary of State, also declared US support for "regime change" in Iran in an intervening speech. Among other indications of the escalation of tensions in the region were attacks by US forces, on the paramilitary forces backed by the Islamic Revolutionary Guard Corps (IRGC) of Iran operating in the eastern regions of Syria. This combined with recent Saudi claims that long-range missiles fired by Houthi rebels in Yemen towards Riyadh are provided by Iran, indicate the high levels of tension and the serious threats facing Iran. It is worth mentioning that the foreign policy of the United States during the Obama administration, with regards to Iran, had considered a special role and position for the Islamic Republic of Iran in the "New Middle East Plan" in which the coexistence and conciliation of Iran's theocratic regime with US hegemony in the region were articulated. However, the evidence now suggests that the Trump administration is pushing to impose new conditions and to make specific changes to this framework. This involves a lessening of the role and weight of Iran’s regime in regional developments, in favour of Saudi Arabia. In this context, Tillerson’s recent references to "peaceful regime change" in Iran should be looked at from two angles as regards the new tactics of the US. Firstly, there is the reviving of the failed project of "making alternatives" to act as the "regime’s opposition" by utilising some of the vehemently pro-US forces opposed to Iran’s theocratic regime, such as the monarchists and the People’s Mojahedin of Iran Organisation (MKO). And, secondly, there is the re-implementing of an aggressive diplomacy to enable US political-security leverage in the region through the fanning of tensions between Iran and Saudi Arabia under the well-worn mantra of "fighting terrorism", and the sewing of divisions between the countries in the region under the false pretext of the confrontation between "Shia" and "Sunni". And here, it is particularly important to note the contracts for sale of modern military hardware and technology by the US to Saudi Arabia worth $300bn over the next three years. There have also been credible suggestions made of a secret deal, reached in December 2017, between the US and Israel to confront and take down Iran. We evaluated the election and coming to power of Donald Trump, and his slogans and policies, to be very worrying. Our concern is not one predicated on the inexperience, narcissism or unpredictability of Trump, but rather the belief that the bringing of Trump to the presidency was a purposeful move by the warmongers and extreme right-wingers in the USA to mobilise and gather together the most reactionary and dangerous forces of the ultra-right around the world. The power structure in the Trump administration - just like the power pyramid structure of the Islamic theocratic regime of Iran - consists of dangerous elements who believe in the waging of war as a means to solving wider issues. The crises of the regime in Iran are the results of the fundamental contradiction between the economic interests and the freedom-seeking demands of our nation on the one hand and those of the theocratic regime on the other. This is a contradiction which is ever growing and thus naturally the theocratic regime veers from one crisis to another, graver each time. Both Ali Khamenei and Donald Trump are deceitful leaders who would without hesitation lie to their people to stay in power. They would resort to any option to overcome the various crises they face. The progressive and patriotic forces of our country should not let the interventionist policies and practices of the United States, and its reactionary allies such as the criminal regime in Saudi Arabia and the ultra-right-wing anti-people government of Netanyahu in Israel, determine the future of our country. We have clearly and repeatedly stated that the Tudeh Party of Iran is strongly opposed to any external interference in our country’s domestic affairs and believe that the future of Iran should only be determined by its peoples and the struggle of its progressive forces to put an end to the despotic regime.